Today I worked at T’Arts. I love my days in the shop, sometimes they are really busy, and sometimes they can be quiet, depending on the weather and other things that might be happening. Today it was a bit of both, which meant I had time to mess around with my display, and I had time to make some things, and I had time to serve customers too! 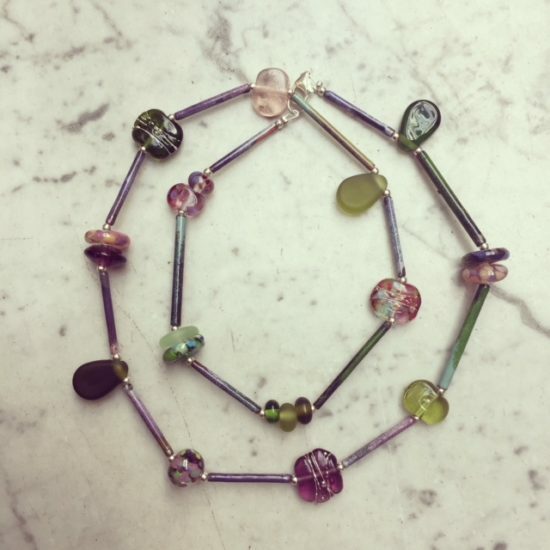 I had been super keen to make another necklace with my enamelled copper tubes, and I seemed to have a nice little selection of green and purple beads, so this is what I ended up making! Hooray for serendipity, because I definitely would not have made this if things hadn’t aligned the way they had.